The other day I read a post about the teams in the Premier League, where they were measured in two areas, The first is how good the team is in creating scoring opportunities, and the other is the PDO. The figures can then put into a matrix where you will se how good/effective or bad/uneffective a team is to create chances, set against PDO which takes into account how effective a team is in scoring goals and how effective a team is in defence measured by the save percentage of the goalkeeper. 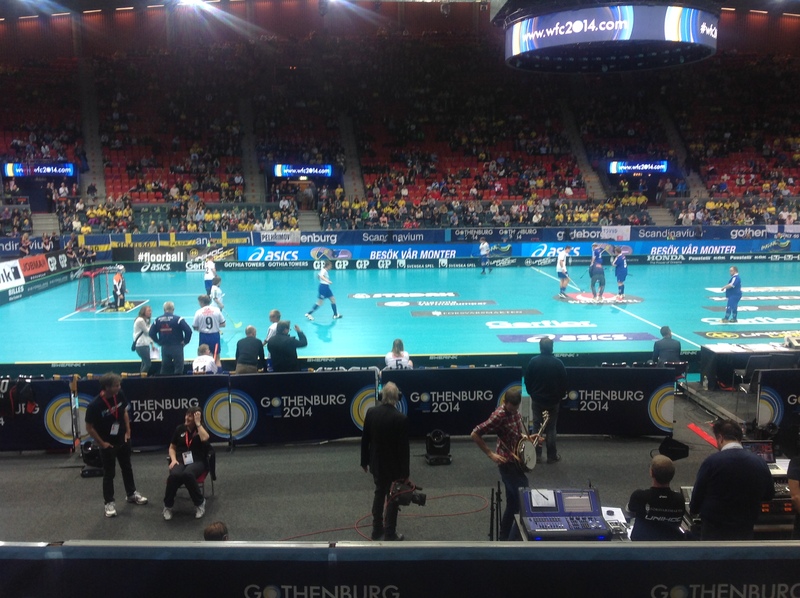 With that in mind, it was to begin working on the figures from the World Floorball Championship in 2014 in Gothenburg. The model has its challenges as obviously become more precise, the more matches are played. Men’s World Cup have a playing system where the top 8 teams meet and the teams 9-16 meet in seperat pools and where nr.1-2 from pools of 9-16, meetings nr.3-4 from pools of a place in ¼-finals. This means that there are differences in the level of teams, and thus represents the model not an accurate picture. 3 teams stand out, Sweden, Czech Republic and Finland. It is interesting that the Czech Republic in terms of statistics, actually are better than Finland in the opening group games. Is the Czech Republic on the way to becoming the first challenger to Sweden? Norway and Switzerland are considered to be nr.4-5, while Germany and Estonia were more effective than Latvia, meassured in terms of the matches in the group stage, then Latvia was as the weakest team of the 8 teams from pool A and B. 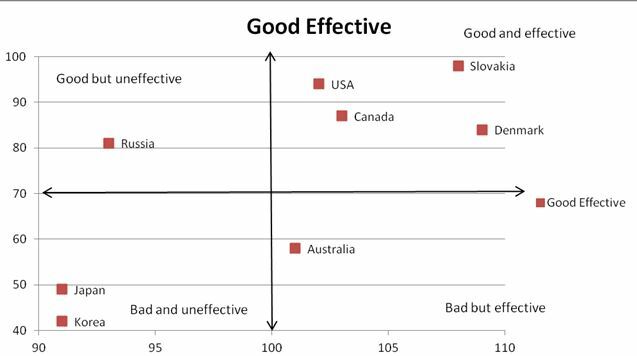 The matrix gives a clear picture, Slovakia and Denmark appears to be the strongest team, with the United States and Canada at the same level, but not as effective. Russia created enough chances, but Russia was not at the level of the Slovak Republic, Denmark, USA and Canada. Japan and Korea ended the World Floorball Championshup number 15 and 16 in the end, and in the group games they were a behind the other teams in group C and D.
Australia showed positive game but did not creat so many chances, but the team did well defensively. The matrix show clearly that Sweden is the best team in the world, and they are second to none. They are producing more chances and are more effective than rest of the teams. Sweden is in their own league. Russia stands out on this matrix, after a not very succesfull groupplay, they played for placement 13-16,and Russia was a bit better than the other teams, and e they scored better in the end, due to bad opponents. Finland did try and challenge Sweden in the final, which was thrilling and well played. 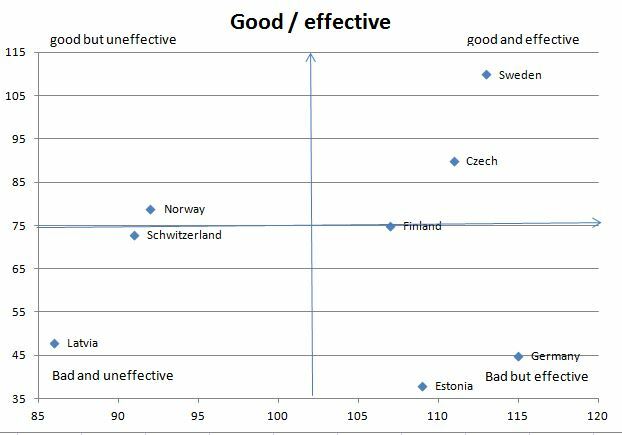 But Finland don’t create as many oppertunities as Sweden and they are not as effective. Finland need to create more chances, if they are to challenge for gold again. The Czechs are still a bit behind Sweden and Finland, but the Czechs do produce more chances than Finland but are not as effectives as Finland, even though it seemed so in the begining of the tournament. Schwitzerland is still a top 4 nation, but they are falling behind the top 3. 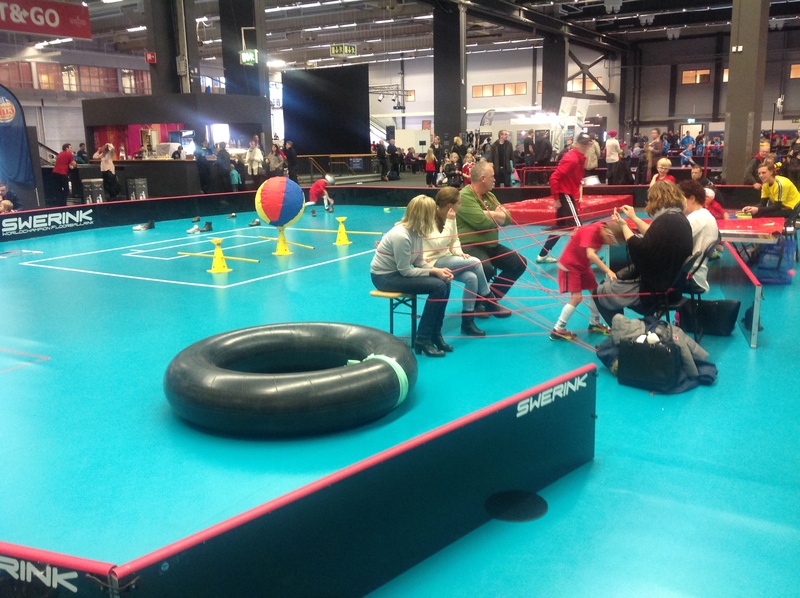 The fast passing game of the swiss needs to change or improve. Norway (6) is at the moment the best bid for a team to challenge top 4, they have some keyplayers who have been at the top for several years. They are still topplayers, but can they take the next step? Or is it time for Norway to bring in new players and can they take Norway a step further? Latvia did end as number 5 at the WFC, this thanks to a team that are physical very strong and who doesn’t give away many chances. They don’t produce that many chances, but are very effective, and this is the key to success. Latvia I don’t see as a challenger for top 4, if they are to be, they must improve a lot on their offensive game. Denmark (7) played a good championship, but they relied a lot on a very solid defence and a good goalkeeper. 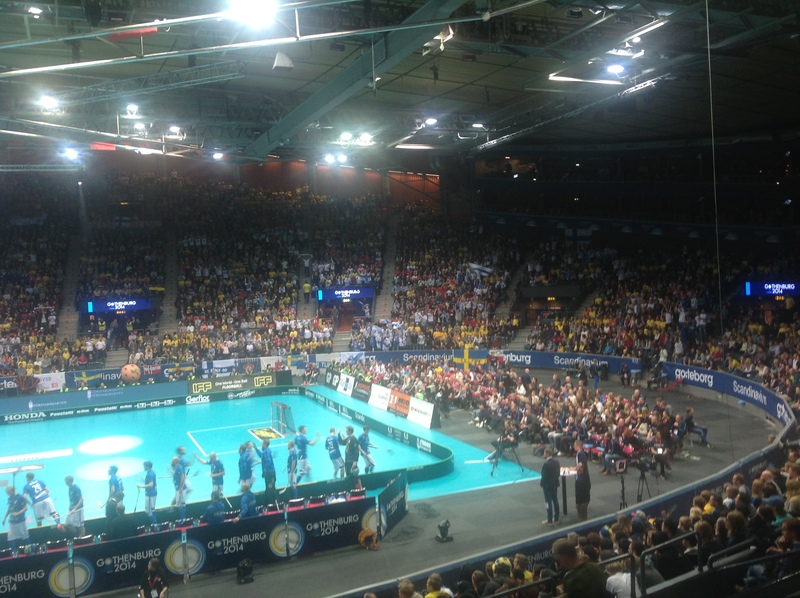 Denmark played a very fast counterattack, and this was the base for their success at the WFC. If Denmark is to take a step up and start to challenge for a top 5 spot, they need to improve their passing and their ability to keep the ball in their possession in order to create more chances. Estonia (8) was up against the wall in many games. They did fight well and worked hard for each other. Estonia did create as many chances as Latvia who ended no.5, but the quality was not good enough. Estonia needs to work on this aspect if they are to challenge for a higher placement. Germany (9) did struggle, they worked hard and was very near a top 8, but lost to Denmark in a tight game. Germany started in the two groups with the 8 best teams, and this reflects their score in the matrix. Compared to a team as Latvia, who ended no.5, Germany did create as many chances as Latvia, but the quality was not good enough. Germany have some very good topplayers who can match the best, is it the players ranked 6-20 who needs to improve? Slovakia (10) was seen as the team who could make an international breakthrough. Looking at the matrix, they seemed to have been doing ok, but looking at the opponents, they met mostly teams ranked from 9-16, and then they need to be more effective, if they are to take next step and challenge for a top 8 spot. USA (11) was a bit better than Canada (12), both teams produced many chances, but it was against teams ranked low, and both teams need to improve their quality in the game in order to be more effective. The breakthrough for USA is wanted, but this need to be done with players based in the USA, in order to improve the quality back home. At the moment scouting European players is working, but USA need to work on their own talents, so they can match players in Europe. Canada have done so with success. Russia (13), was a big disappointment of the tournament, some of the players didn’t look fit, and in the group games they were struggling and ended playing for 13-16 placement. Here they were far better than their opponents, and their score on the matrix showed this. Australia (14) was better tactical and more effective than Japan (15) and Korea (16). The Aussies plays with a big heart, but to takes a step up, a big heart isn’t enough. Japan and Korea are two very important nation for the future of floorball. Floorball needs a breakthrough in Asia, and for floorball its important with these two taking responsibilities for the progress. Especially Korea have impressed me with their efforts, and look out for them in the future. If they continue as they do at the moment, they will be the stronghouse of Asia, and hopefully a team who can challenge Europe. Next 5.000 tilskuere til den danske floorballfinale!